The advent of 3D is upon us, and it's not just movies where we don weird glass. This 3D is true three dimension and it appears one layer at a time from a printer connected via WiFi to our device of choice/ Yes, folks we are one step away from printing up food or replicating a pizza that is fabricated right before our very eyes. The thing that strikes me is that this machine, The Buccaneer, is not some big and fancy heavy-duty, industrial monolith. It's a quaint little desktop machine that will unassumingly and elegantly occupy the spot next to your laptop, and look elegant just sitting there. 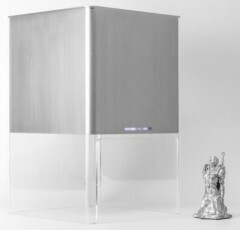 The Buccaneer is the first of consumer-targeted 3D printers that is designed for the home. It comes with a simple GYU that resides on your computer where you can either feed blueprints to it, or you can design your own object and the software that resides on your computer will then do all the necessary calculations and communicates it to the printer that will then lay the resin layer by layer till the object is complete. In that way it's kind of like how the pyramid was built, if you can imagine that, except without the thousands of people and at a size that will fit on your desk. The idea of the folks at Pirate3D, the makers of the Buccaneer, is to make 3D printing affordable to the home and since it’s targeting the home, the designers have also made every possible effort to make the Buccaneer easy to operate. From insertion of the plastic spool, to designing on the application and even downloading generic designs, it’s all meant to be easily accomplished. So far Pirate 3D has surpassed the million dollar mark at Kickstarter with a tremendous outpouring of interest. The printer is scheduled to ship in February of 2014. It will be interesting to see if next years Valentine's Day gifts will be bought or printed.